Dr. Robert F Klie, Assistant Professor of Physics, specialized in Experimental Condensed Matter Physics. Dr. Klie began his undergraduate studies in Physics at the Rheinische Friedrich-Wilhelms-Universität in Bonn, Germany and graduated in 1998 from Kingston University, London, UK with a B.Sc in Physics. After receiving his Ph.D. in Physics from the University of Illinois in 2002, Dr. Klie joined the Materials Science Department at Brookhaven National Laboratory (BNL) as a Goldhaber Fellow. Following the completion of this fellowship in 2005, Dr. Klie accepted a position as an Assistant Scientist at BNL’s Center for Functional Nanomaterials. In his research, Dr. Klie pursues the development and utilization of atomic-resolution transmission electron microscopy of nano-scale materials systems. 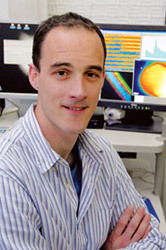 He utilizes a variety of analytical techniques, including Z-contrast imaging and electron energy-loss spectroscopy to study the effects of defect and interfaces in superconducting oxides or borides, semiconducting oxide hetero-structures, and heterogeneous catalyst systems. His recent publications include “Direct Imaging of Cooperative Doping Mechanisms at Grain Boundaries in Ca-doped YBa2Cu3O7-δ,” (Nature, 435, 2005) and “Electron energy-loss spectroscopy study of electron-doping in MgB2,” (Phys. Rev. B., 73(1), 2006).